Castle Douglas lies just off the main A75 road from Dumfries to Stranraer at the north end of pretty Carlingwark Loch. It serves as an important regional centre for a large area of rural Galloway. There's been a settlement here for many centuries, although until the end of the 1700s it was known as Carlingwark. 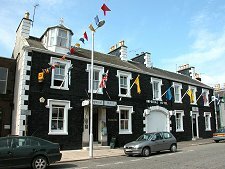 From the 1760s the town benefitted from being on the route of the military road built from Bridge of Sark on the English border via Dumfries to Portpatrick. 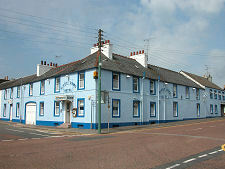 Carlingwark became Castle Douglas in 1792 after Sir William Douglas laid out a new village on the site of the old. Today's street plan has changed little over the past two centuries. It is rectilinear in form, comprising three long parallel streets linked by cross streets. 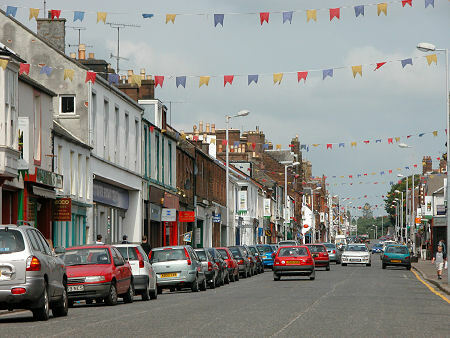 The main street is King Street, with to its east Queen Street. 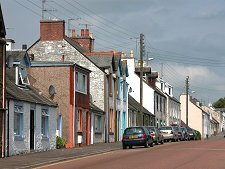 A clue to the original purpose of Castle Douglas can be found in the name of the third parallel street: Cotton Street. 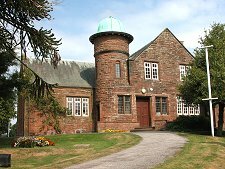 Castle Douglas was established as a centre for the hand spinning of cotton. For a time the plan succeeded, but in the long term there was no way Castle Douglas could compete with industrialised cotton spinning in huge water-powered mills like those at New Lanark, established seven years before Castle Douglas itself. But if the town did not succeed as a centre for cotton spinning, it certainly did in other ways. Later roads, up to and including the current A75, tended to follow the general route of the first military road. 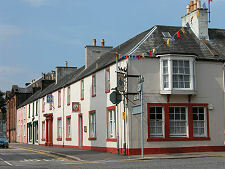 The evidence of the importance to the town of the through traffic across south west Scotland is clear from the presence of a number of large hotels whose origins obviously lay in the coaching days of the early 1800s. The railway came to Castle Douglas in 1859, only to disappear along with many other rural lines in 1965. 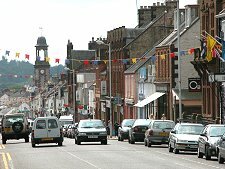 But throughout the period Castle Douglas's role grew as the largest market town for a considerable distance in any direction. Evidence of this can be seen from the Auction Mart towards the east end of the town. 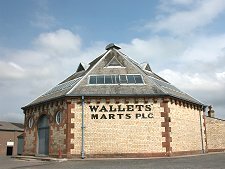 The typical hexagonal market building built in 1900 is accompanied by extensive stock yards indicating the scale of activity here. 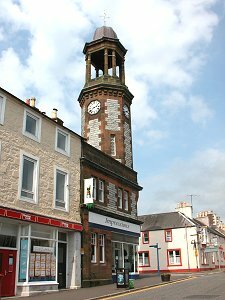 The most outstanding feature on King Street is the large octagonal clock tower built in 1935 on the site of an earlier town house and steeple which had burned down. 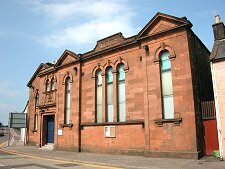 A short distance along Abercrombie Street from the clock tower is the town hall dating back to 1863, while nearby is the RC Church of St John the Evangelist, built in 1868. 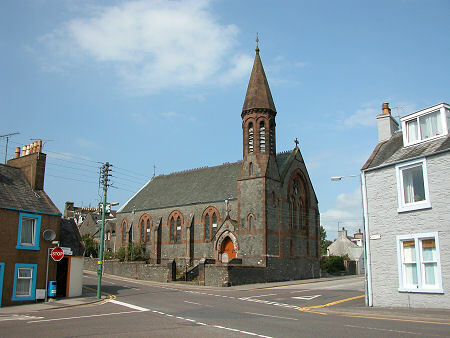 This is one of five churches in Castle Douglas, including the Parish Church in Queen Street and the nearby former Parish Church, converted to a theatre in 1992. 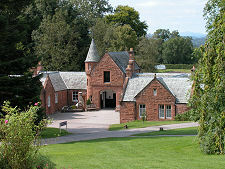 Castle Douglas is increasingly seen as a base for those touring south west Scotland. It is centrally located in a part of the country which always turns out to be larger than expected. 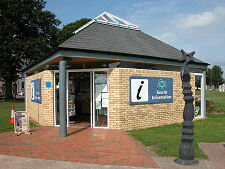 It also has a couple of outstanding visitor attractions in its own right. Just to the south west of the town are Threave Gardens, run by the National Trust for Scotland; while a mile or so further west is Historic Environment Scotland's Threave Castle, spectacularly located on an island in the River Dee.